S-200, the silent snow effect machine from Antari uniquely designed to compliment all your scenes where silence is golden. 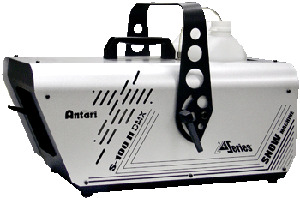 Great break-through and progress has invested in this new Antari S-200 in terms of its noise level and the formation of snowflake. Output of the snowflake is adjustable; this enables producing different volume of snow output from a light snowfall to a heavy flurry. The S-200 has standard DMX on-board including SC-2 volume control remote. During its fogging production, it is only 63 dB that is loudly as people whisper lightly. This light and portable machine is perfect for club effects, movie sets and stage settings where quiet scenes are demanded.